Adam Bodzioch 02/13 as funckiana x andreana. Imported by Peter Tristram. Derek Butcher...."Adam: Surviving the cold may be a challenge in Adelaide. Both these species were considered synonymous by Lyman Smith and it was not until 1989 that the Germans went to great lengths to prove they were separate species. NOW the Germans are mixing the genes and too scared to register." Peter Tristram..."Enjoy the plant Adam. I can assure you it is much hardier than either parent and has some of the best of both. I saw it in the US too, Derek, so I suspect the gene mixing with these 2 species is not only a European phenomenon. I suppose we could cross funckiana from one locality and funckiana from another and Alfred Blass would be happy?" Chris Larson...."I'm with Peter on this. It is a much hardier plant than either of the other 2, at least of the forms of the species I have grown under my conditions. So often wildly differing forms of a species, or 2 closely allied species, are crossed in the hope that the progeny are more vigorous - which is a valid aim for some hybridizers. 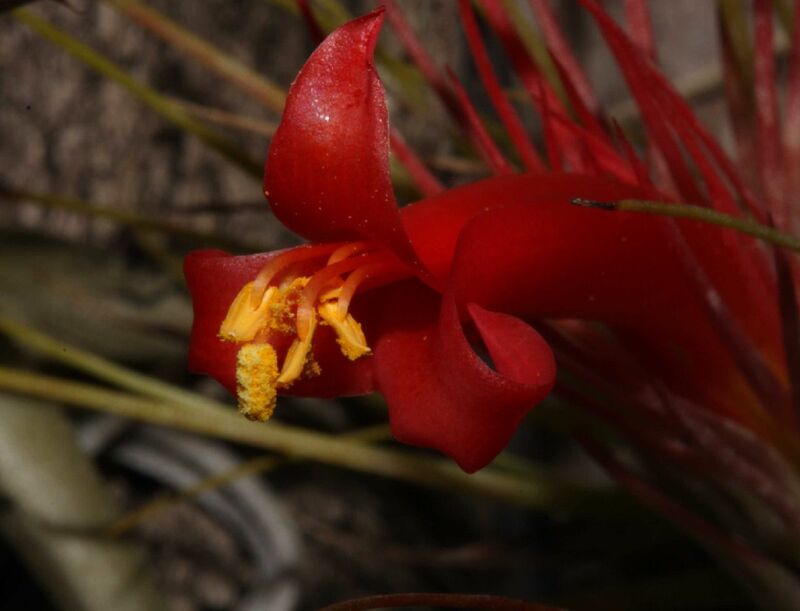 So often I've seen forms of species which would never have met in the wild have their pollen transferred & the progeny considered true species - just because botanists call them by the same name - as Peter points out. The concept of species versus hybrids is very interesting in these cases." Michael Mathieson 02/15 as andreana x funckiana Chris Larson, 05/06. 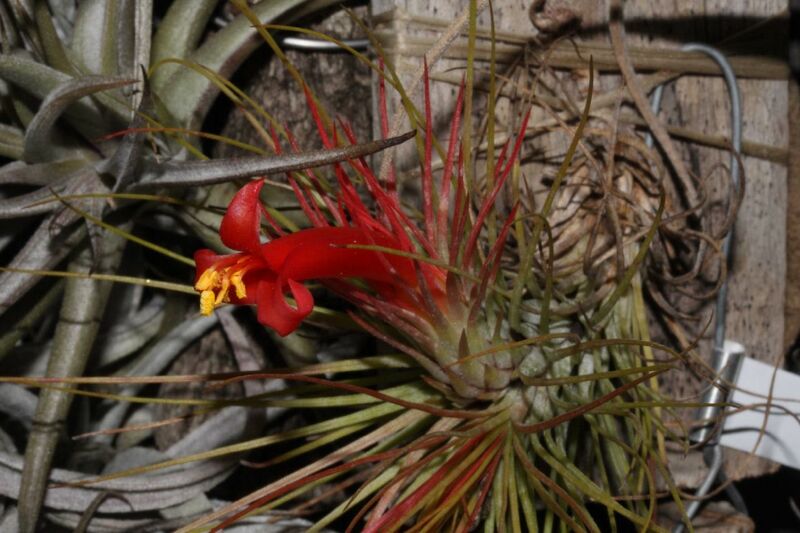 Michael Mathieson ... "a small hybrid that is flowering for me at the moment. I find it a little less fickle to grow here in Ipswich than either of its parents." George Stematis ... "Mine are flowering at the moment also." Geoff Lawn ... "As several growers at least have had it some years, obviously it's been in circulation but this parentage is unrecorded and presumably the cultivar has never had a cultivar name ? Who bred it and when--a local hybrid or imported from overseas ? It looks caulescent and each mature rosette about 20cms. diameter--is this correct ? 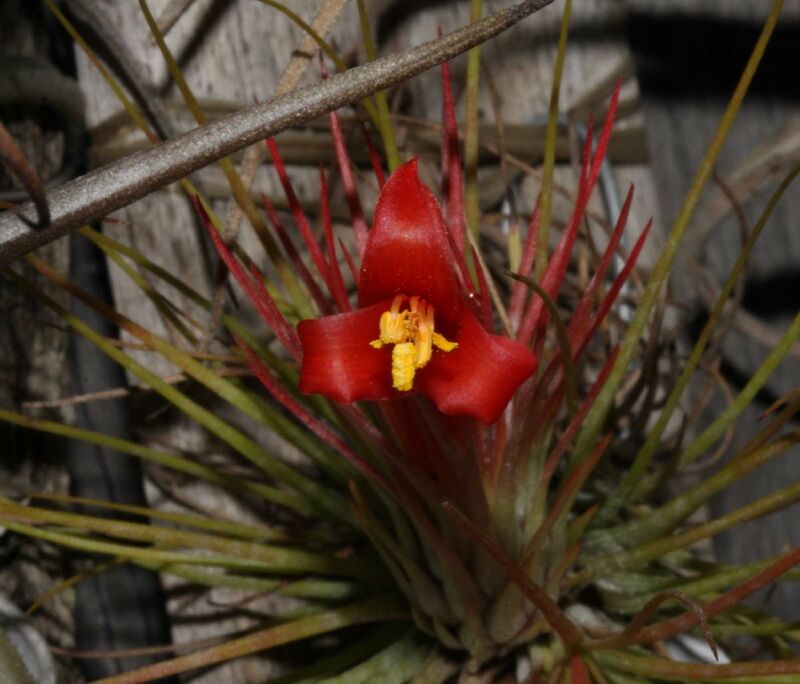 I need all these details to register it in the BSI's Bromeliad Cultivar Register (BCR)." Chris Larson ... "This plant is not really caulescent and much smaller than your estimation – I didn’t measure it today. 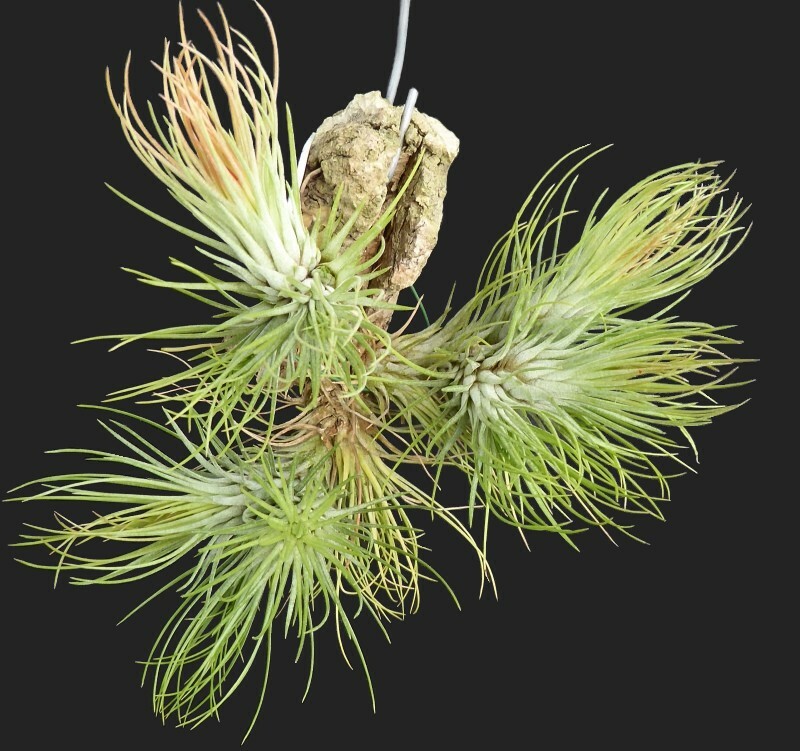 Not a lot bigger than funckiana – but then again the andreana, prior to the ones currently available from Collectors Corner, were all smaller plants in my experience. The plant in the photo above is about to flower, and has a seed pod on it ( again)." Michael Mathieson ... "Chris is correct. The plant in my images is a little elongated by the flowering stage but I would not call it caulescent. 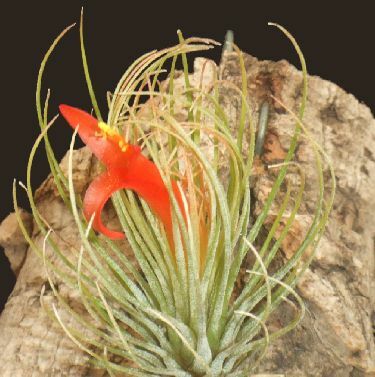 The diameter is about 7 cm leaf-tip to leaf-tip and the stems are about the same." Peter Tristram ... "I imported this hybrid (though the other way round after checking the list from 2010 - funck x and) from Holm in Germany. I have no idea if anyone else has sourced it or the other way round or a remake, elsewhere. There are so many forms of funckiana too to add variety if anyone likes to do the cross. I imagine it would be much easier/more reliable to use funckiana as mum as andreana selfs like mad and funckina doesn’t. It is slightly caulescent and hardier than either parent – a very attractive little gem." Peter Tristram ... "Call it Funkandfun ? Burkhard is silent. I was hoping for German names! How about Funkandspass? Mother was the funky one. Holm is Dutch anyway and the Dutch are somewhat like Aussies – laid back." Derek Butcher ... "Auntie Margaret says that 'Funky One' is better and has less chance of a spelling mistake." Peter Tristram ... "Funky One will do me fine – naming credit to Auntie M! Chris and I imported the cross in 2010." Derek Butcher ... "This is what Geoff & I intend to put on the BCR. Holm, Germany. Sometimes quoted with reverse parentage. Plants imported from Germany to Australia in 2010. Plant about 6 cms. diameter at flowering. Named and registered in Australia."